39 miles. Allow 4.5 hours. 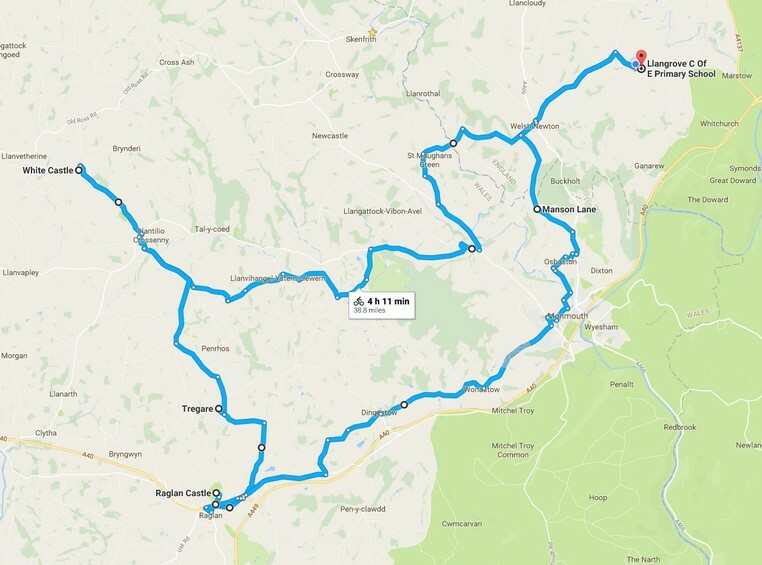 This is a gently undulating route which should be manageable for most casual leisure cyclists. Where possible the route has been devised to avoid steep uphills. The route follows quiet roads and lanes, many of which are almost traffic-free and includes some sections of National Cycle Network lanes. It is suitable for all cycles, particularly touring and hybrid bikes, and the only steep hills are those at Welsh Newton then a short but stiff ascent in Manson Lane, Monmouth on the return route. Start from Llangrove C of E Academy and head along the Llangrove Road passing the Church on the right and Royal Arms on the left. At the T junction, turn left towards Welsh Newton and follow the lane uphill passing Treworgan Farm buildings and roadside pond on the right. Following the descent into Welsh Newton, with the church on the right, turn left at the T-junction towards Monmouth than take the first, almost immediate, turning on the right to Llanrothal. Ignore the turning on the left signposted ‘Old Shop’ and continue along this lane, stopping to enjoy the views on the left opposite ‘The Nunnery’ before the lane descends a long hill. Over the hedges to the left are panoramic vistas of open fields along with the lane being followed on this route as it weaves through the countryside. Follow the road as it bends to the left towards Tregate, ignoring the turning to the right to Llanrothal. The road now descends steeply towards Trigate Bridge (test your brakes…) then through the settlement of St. Maughan’s Green. At the T junction beside Wenlock House on the left, turn left following the direction sign to Maypole. The road bends to the left as it enters the village (sp Rockfield) and continues to a T junction with the B4347. Turn left towards Rockfield – the only direction to not be signposted. The lane follows a gentle descent towards Rockfield, running alongside the River Monnow to the left for a short stretch before a black and white timbered cottage on the right adjacent to a small green area with a memorial and seating. Turn right here in front of the cottage then immediate right again to join the B4233. Although one of the ‘main routes’ of the area, this is an exceptionally quiet road through open countryside offering easy cycling with just a few slopes and no major hills. Continue along this lane for approx 5.9 miles through Tal-y-Coed passing Warwick’s Country Pub on the right where refreshments are available Wednesday-Sunday. A mile further along the B4233 is the sign marking Llantilio Crossenny, shortly after which take the small turning on the right up to White Castle, passing the small moated area of Hen Gwrt, the old court, on the right. The narrow lane continues steadily uphill with ‘Lower White Castle’ and ‘Middle White Castle’ cottages making your progress until you reach ‘Upper White Castle’ at which point the short lane to the left leads to the large, moated castle. Opening times: Free access at all reasonable times. Cycle racks and picnic benches available. Retrace your route from the castle along the lane passing Hen Gwrt to meet the B4233 at the T junction and turn right towards Abergavenny then almost immediate left up the short lane towards St. Teilos church on the left (worth a detour). Follow the lane as it bears to the right (with church lane detour to left) then at the white house on the left, turn left following the sign to Penrhos 2.5 miles. Cross a small stone bridge then pass farm buildings on the right and on meeting a lane to the right towards Raglan, continue straight ahead towards Penrhos (1.5m). Continue along the hedged lane with open farmland to each side along this pleasant and easy stretch of the route towards Penrhos. Direction signs are now becoming a rarity at junctions and when meeting the next T junction, there are no directions at all other than indicating you left Llantilio Crossenny 1.5 miles ago. Turn left and continue along the lane then take the first turning on the right to Penrhos. After crossing more open farmland, the lane leads to the very tranquilly situated Lam Rim Buddhist Centre on the right. Pass Lam Rim and continue along the lane, passing The Old Vicarage on the left, as you approach Penrhos village with the large church on the left. Follow the lane as it sweeps to the right, crosses a small bridge and continues to an unsigned T junction. Turn left and continue along the hedged lane for 0.8 miles to another unsigned T junction and turn left. After a short distance you will see the first landmarks for some time, Tregare Church and Hall on the right, along with a letterbox set into a stone wall with stone ‘hand’ adjacent. After visiting the castle, retrace your route back to the A40 and, in preference to cycling along this especially busy stretch, it is recommended you retrace via Monmouth Road and cross the A40 at a quieter point then continue to Groesenon Road running parallel to the A40 but with only a tiny fraction of the traffic. Having rejoined Groesenon Road at the junction with the lane to Tregare, do not turn left back to Tregare but continue along Groesenon Road, running parallel to the A40 for a short distance, towards Dingestow, passing Sutton Frank agricultural machinery store on the right. This is a very quiet road which passes the A40 services on the right, a handy source of refreshments. After the bus stop on the left, turn left onto cycle route NCN 423 which follows a quiet country lane to Dingestow. On reaching Dingestow, a short detour can be made to visit the church by taking the short lane on the left. Leave the church and rejoin NCN 423, turning left at the camp site to cross the bridge over the River Trothy. Continue along this lane for 3.9 miles until reach the small roundabout and reuniting with the B4233 Rockfield Road as you approach Monmouth. The road climbs steadily passing Monmouth School on the left. After 1.2 miles, turn left onto Manson Lane, a quiet residential lane with some stunning views from the top. Unfortunately, there is a climb to reach these views and on reaching the spot in front on the cottages with the fantastic views, it is worth taking a short break here before riding the rest of the lane which includes tackling steepest incline of the route. It’s a short incline, but it’s a tough one which is likely to challenge most riders. Continue up the sharp hill but take comfort in knowing the rest of the lane is either flat or downhill and is the last-but-one climb of the ride. At the T junction, turn right and continue to the T junction rejoining the A466. Cross the A466 by turning left then immediate right beside the memorial towards Welsh Newton with the church on your left. This now is the last uphill of the ride. Once at the top you will be rewarded with a long mile descent until reaching the turning for Llangrove on the right. Turn right to retrace your outward journey and return to Llangrove C of E Academy to complete the ride.